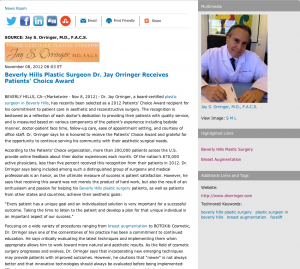 Beverly Hills, CA — Dr. Jay Orringer, a board-certified plastic surgeon in Beverly Hills, has recently been selected as a 2012 Patients’ Choice Award recipient for his commitment to patient care in aesthetic and reconstructive surgery. The recognition is bestowed as a reflection of each doctor’s dedication to providing their patients with quality service, and is measured based on various components of the patient’s experience including bedside manner, doctor-patient face time, follow-up care, ease of appointment setting, and courtesy of office staff. Dr. Orringer says he is honored to receive the Patients’ Choice Award and grateful for the opportunity to continue serving his community with their aesthetic surgical needs. As he looks ahead, Dr. Orringer says that receiving the Patients’ Choice Award is an honor that only increases his enthusiasm for what he does. He says that whether he is performing a facelift or a tummy tuck, emphasizing individuality, patient involvement, comfort and satisfaction tend to make for a positive and caring experience. Located at 9657 Brighton Way, Penthouse in Beverly Hills, CA, Dr. Orringer’s practice can be reached at 310-273-1663. He can also be contacted online via the website: drorringer.com.